Imagine having tiny possums? gliding between trees in your garden. This experience was common in Monty once at the time of but is now very rare. A combination of fewer trees, a lack of suitable nesting places and the ever increasing numbers of cats have all contributed. We are offering sugar glider nesting boxes to schools and private homes. They are available at the cost price of $15 per box. We have already put up 30 in reserves with 3 boxes now occupied. We aim to have more than 100 up around Monty. However boxes must be in places of continuous tree canopy, preferably native.. Sugar gliders need trees to be less than 50 metres apart to travel safely. Email us at montysugargliders@gmail.com to register your interest. Apart from being the cutest of neighbours Sugar Gliders are a great indicator of habitat connectivity. 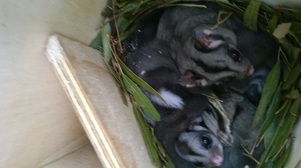 The Monty Sugar Glider Project is part of a broader vision to create habitat links through Monty. 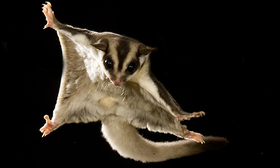 Since putting up the boxes sugar gliders have been sighted in Pecks Dam reserve, Olympic reserve and Kirwana. Two local residents have also seen them in their gardens. Read on for what has happened so far. 1. An indigenous garden award was held in 2012. The awards helped to bring people with a love for the Monty wildlife together. 17 applications were submitted by Monty residents, churches and schools. A panel of residents with expertise in gardening and sustainability chose the winners. More than 60 people attended the awards and garden tours that followed. Our thanks to Banyule City Council who funded the prizes. Three of the winners went on to join an MCG bio diversity group (MDG) This group’s vision is to establish habitat links through Monty that connect with the wildlife corridors along bordering waterways. They include the Plenty River, the Yarra, and Diamond Creek. These tiny marsupials win people over very quickly. The bid to bring them back already has local residents calling to ask about boxes for their garden. Thanks to local men’s sheds another 60 are currently being built for residents gardens. The Monty Habitat Links project. As mentioned above the MBG aims to establish habitat links through Monty that connect with the wildlife corridors along bordering waterways. They include the Plenty River, the Yarra, and Diamond Creek. To determine where the most likely links are, the group has studied arial maps under the guidance of Richard Francis of ABZECO. Many hours were then spent visiting those places on foot to establish if trees are re native or exotic, on public or private and possible links over the major roads that surround us.E.G Bolton street, Sherbourne Road, Para Road and main Road . This information was then overlaid on the maps to help tell us where the most likely links are. The green neighbourhood of Pecks Dam was identified as the most likely place to find gliders and a critical hub for wildlife in Montmorency. Three gliders have since taken occupancy in a box at the dam, so it appears that we are on track. It will also play a key role in the larger project Photo of Pecks Dam. We have been gathering interest along the way. Six more boxes went up at Pecks Dam. Richard Francis used the opportunity to show interested residents how best to install a box. Photo A number have offered to put up boxes in reserves. The Monty Community Group has been successful in securing a third grant from Banyule City Council. It will be used to develop promotional materials. This material will be letter boxed to residents in areas of good canopy to encourage involvement both the sugar glider project as well as the bigger Monty Habitat Links project. Many Monty residents have advocated for protecting Pecks Dam over the years. Residential development has seen more and more water directed away from the dam which has become a collection point for local rubbish. Last year council contacted the Monty Community Group for help in consulting with the Monty Community about the dam. The group joined forces with Friends of Monty Bushlands and former members of the defunct Peck Dam to organise a public meeting. 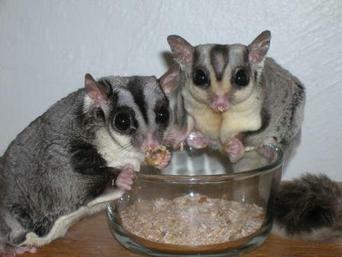 The Sugar Glider project aims to bring back Sugar Gliders to Montmorency. Sugar Gliders are tiny possums capable of gliding up to 50 metres. They eat insects like cockroaches, spiders and eucalyptus flowers. To do this the project aims to establish habitat stepping stones connecting with creeks and rivers surrounding Montmorency. We are providing nesting boxes for interested residents who are in certain areas with significant tree canopy.